There aren’t many bunnies out there with the attention-grabbing skills of Marlon Bundo Pence, a soft rabbit belonging to the second family. Then again, as demonstrated in the new children’s book Marlon Bundo’s a Day in the Life of the Vice President, there aren’t many bunnies with the audacity to use their good looks and pleasant demeanor as a fluffy tool of mass obfuscation. Marlon Bundo’s a Day in the Life of the Vice President, out today under conservative publishing house Regnery Publishing, was written by Second Daughter Charlotte Pence and illustrated in watercolor by Second Lady Karen Pence, an art therapy advocate and craft enthusiast. A portion of the proceeds will go to charity. Bundo, also known as BOTUS, is a uniquely long-lived member of the Pence family menagerie, which also includes Australian shepherd Harley, the kitten Hazel, the recently deceased cats Pickle and Oreo (RIP), the recently deceased beagle Maverick (RIP), and 30,000 bees. But Bundo is no mere pet, content to hop and poop and sniff things. With nearly 18,000 Instagram followers, he has become a living symbol of the second family—and one whose mass appeal outperforms other plausible family symbol options, such as a small wooden cross clutched in a bleeding white fist, or the word “Mother” spelled out in corroded oil pipelines, or Mike Pence. This may be true over at the Washington Post, but I disagree in the strongest terms. Marlon Bundo is cute, I’ll admit, but it is an indisputable fact that underneath his huge blinky eyes and nice fat tummy lies the twisted heart of a dirty trickster. Does he really think he can pull the wool over our eyes? Or fur, I guess? Who does Marlon Bundo think he is, Jennifer Lawrence in the critically panned spy film Red Sparrow? I would ask him, but it seems that he can only communicate in verse. “There are a lot of little things that are official duties that the vice president does that I didn’t necessarily know until my dad was in that role,” Charlotte Pence told the Indianapolis Star. So what does Vice President Mike Pence do, Bundo? Huh? Coordinate his political future with Charles Koch? Mount an anti-contraceptive takeover of the Department of Health and Human Services? Demand apologies from Joy Behar? But the most important meeting is first. That’s the one with the president! In this passage, as is true throughout the book, the Pence family bunny conceals significant details. What meetings? Is he deliberately misleading us? Does Bundo even care? Is he simply a dumb animal? What kind of a lunatic would rhyme “events” with “president”? The world is in chaos, and Marlon Bundo is at the center of it all, letting the American people down with his wicked games. With its fluffy carpet to walk on. While Grampa and the president talk on. WHAT ARE THEY TALKING ABOUT???? We’ll never know! In spite of his huge ears and ample free time, Bundo has chosen to stuff his face in willful ignorance rather keep the American public informed about the goings-on of a historically corrupt White House whose occupants are under federal investigation. I wouldn’t go so far as to claim collusion (or would I? ), but complicity? Absolutely. To the top of the ceiling so high. And the morning is flying by. Do you see what I mean? No detail. The morning just flies by, without substance or comment. What is he hiding? Where is his security clearance? Also, did someone’s toenail really look like this, and if so, is she okay? And yet this passage, too, is suspect. 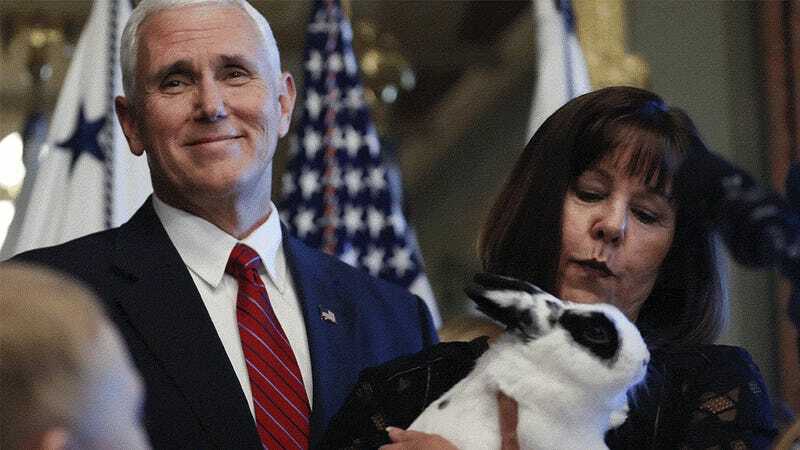 Does Marlon Bundo truly expect us to believe that Vice President Mike Pence holds hands with a bunny while he reads the Bible? Does Marlon Bundo think I am stupid? Oh really, Marlon? All the time? That’s nice. Do you know what isn’t nice? The fact that a spiritual yet clearly malicious bunny has infiltrated the hallowed grounds of the Naval Observatory, serving himself up as a distraction to cloud the American people’s judgment regarding his extremist Grampa. Bundo—when I say my prayers at night, as my little bunny places his paw on my hand, I pray that your conscience will one day compel you to tell us what you really know.